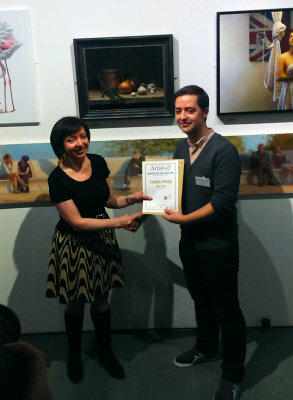 Last January as a follow up to my win of the Third Prize at "The Artist Of The Year" competition, I attended the Reception and Awards Ceremony at The Mall Galleries. Last January as a follow up to my win of the Third Prize at "The Artist Of The Year" competition, I attended the Reception and Awards Ceremony at The Mall Galleries. It was a wonderfully memorable event and a great opportunity to rub shoulders with other short-listed artists whose works I had seen previously in the magazine and otherwise but had never been able to connect them to the faces behind them. It was a windy and wet day in London but despite the weather the event was very well attended, and along with other 49 participants in the exhibition upon arrival I received a warm welcome and a glass of champagne. The organisers of the show and staff of "Artists & Illustrators" were brilliant and very friendly and I was thrilled to be able to meet so many new and interesting people in one evening! Many thanks to everybody who made that event happen!